One of Britain's biggest cities has turned to Cambridgeshire's guided busway for inspiration for sorting out its traffic problems. In April Manchester will open 14 miles of new busway, 4.5 miles of which is guided – having taken advice from the Cambridgeshire officers behind the increasingly well-used scheme between St Ives and Cambridge. 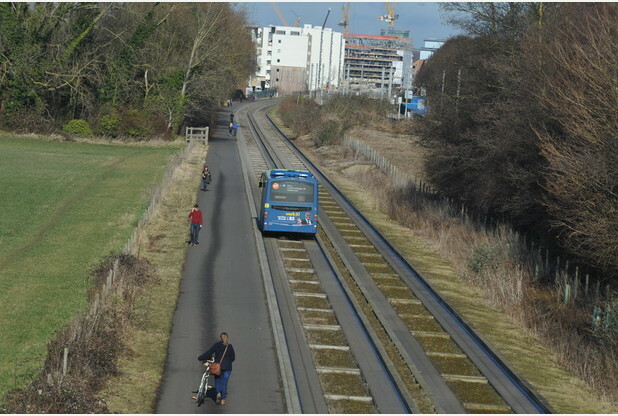 Despite initial scepticism the Cambridge guided busway continues to prove popular beyond all expectations. The latest figures for October show 336,000 used buses on the guided busway that month – well above the predictions in the busway's business plan, which were supposed to include passengers from the new town of Northstowe. There have now been more 13.6 million passengers on it since the busway opened in August 2011. The 12-month rolling total is 3.6m. The busway is also expected to see a further surge in popularity next year, when the first homes at Northstowe are completed and the new Cambridge North railway station opens. Manchester is one of a number of major cities turning to bus-based transport systems to tackle congestion. Cambridge's City Deal board is due to visit Manchester in the coming months to assess the measures they have taken with buses. These include installing a considerable amount of bus lanes, as well as making a main street bus only to get buses from its busway into the city centre. "Cambridge led the way with its long-distance traffic-free busway connecting Huntington, St Ives and Cambridge, which now sees around 12,000 journeys a day, including my mother, who comes in from Longstanton park and ride to Cambridge and finds it brilliant," said City Deal board member Cllr Francis Burkitt. "Now we see Manchester following where Cambridge led, with its 14-mile busway, of which 4.5 miles are guided, and the rest on dedicated lanes mainly on existing dual carriageways. And there's a separate path alongside for cyclists and walkers. "Within the city of Manchester, the project has included new segregated cycle lanes, better pedestrian crossings, and changes to reduce rat-running through residential areas. "Just as Manchester leant from Cambridge, now we can perhaps learn from its recent experience, as we work out how best to link together more of our communities in Cambridgeshire. "For some connections, rail will be the answer. For others, bus will be best and far quicker to deliver. We also need good, safe cycle links between our villages and the city. "So it's important that we look at other successful schemes in the UK and internationally, and use their examples to fulfil our vision, over the next decade or so, of making Cambridgeshire's transport links something we can all be truly proud of and use regularly." The guided busway has caused a number of issues for the county council, having been delayed, run well over budget and been the subject of a legal dispute with contractor BAM Nuttall. The findings of the latest investigation into problems with the guided busway is due to report in the coming weeks, Cllr Mike Mason told its full council this week. The proposals for new bus infrastructure between Cambridge and Cambourne, as well as along Histon Road and Milton Road, have undoubtedly been the most opposed aspects of the City Deal so far. But it is not just Cambridge turning to buses to solve congestion, given they are cheaper and quicker to deliver than railway and trams. Belfast is rolling out a series of schemes as part of a comprehensive 'bus rapid transit' network; Bristol will next year open its new £200m 'Metrobus', while bus rapid transit has been the preferred link of choice between Sheffield and Rotherham. Plus, an extensive piece of analysis by the Department for Transport of 33 'major bus-related schemes' completed over the past five years found they had a benefit-to-cost ratio of 3.9:1. This means that for every £1 they cost, these schemes generated £3.90 of economic benefit.